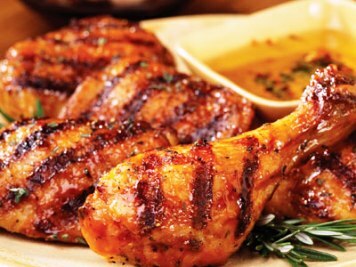 Chicken seasoned with salt, pepper, and Greek oregano is cooked over the coals and basted with latholemono (oil and lemon sauce) for a fabulous dish that can only taste better when eaten with the hands. In addition to basting with and oil-lemon sauce, serve with lemon wedges for a last minute squeeze. Combine lemon juice and olive oil in blender and beat at high speed for several seconds until thick and creamy. Brush meat lightly with a little of the sauce. In a small bowl, combine salt, pepper, and oregano. Lay chicken on a platter and sprinkle on both sides. Heat meat rack 4-6 inches over red hot coals for a few minutes. Spread coals evenly and cook chicken for about 10 minutes on each side. 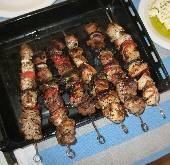 Use tongs to turn frequently, basting often with the oil-lemon mixture. Test for doneness. Serve with lemon wedges, and extra lemon wedges for hand cleaning.